This is the third and final installment of this week's three-part Restaurant Week miniseries. Yesterday, I told about lunch at Kaz Sushi Bistro in DC, and Monday I discussed our experience for a dinner at U Street's Vinoteca. Our Restaurant Week explorations and adventures culminated in an early weekend evening dinner at Dan & Brad's, the restaurant of the Arlington Hilton in Ballston. It was very quiet for a nice place for dinner on a weekend, but it was just six PM, so I didn't think too much of it. For what was lacking in crowds, it made up for in service and ambiance. The look of the place is very homey, with a twisting layout to the dining room, and little private nooks overhanging the lobby below. The decor was English-feeling-Euro and was very sharp. Despite being the only ones there, we were sat in the middle of the most open dining room rather than a private nook for two, and I was admittedly a little disappointed. Our waitress was very attentive, knowledgeable and elegant, winning me over with the bits of proper French she threw into her descriptions. She started us with some crunchy, warm bread and fresh butter, a simple, rustic pairing that outclassed the bread and butter/oil that the vast majority of places ever offer. The prix fixe RW menu was very intriguing, but had almost nothing to do with the normal menu. This was a little bit of a letdown, since the menu had seemed filled with unique dishes, but at the typical $35.08 for dinner, offering a selection for three courses, I still couldn’t pass up the RW menu. RW at D&B’s also had the option for an additional flight of three wines (a Cabernet, a Chardonnay and a disgustingly sweet, undrinkable ice wine) for $10. We decided to sample the sampler together and got almost three glasses for the price of 1. The menu for the first course included a seared ahi tuna with a bean and olive salad, a warm ancho chili-rubbed beef tenderloin and fig salad, an heirloom tomato Carpaccio salad, a crab and corn chowder and a fresh chilled gazpacho. A hard choice, no? Julia chose the tomato Carpaccio, which had a bright, country feeling and tasted extremely tangy and fresh, but it was huge slices of tomatoes -- nothing near how I would envision a Carpaccio of tomatoes. It had some nice greens on top and was deliciously dressed with olive vinaigrette and some gorgeous, cool goat cheese, so I still found it to be a very unique salad. I, on the other hand, was apparently in a very "meaty" mood and ordered the tenderloin salad. It was rightfully far smaller and daintier than the more robust tomatoes, which is a rare feat for a meat dish up against a vegetarian one. However dainty it might have looked though, it didn't matter. The perfectly medium tenderloin with the ever so slightly sweet sauce of sour cherries and the soft, melt-in-your-mouth figs was a warming and winning combination. It was one of those dishes that is just enough food and goes down so smoothly that you want to kiss the plate after. Yes, that was this dish. You never know when they're coming, but I refrained from actually kissing the plate. I had to save the plate-kissing for the entrees. The dinner choices were equally if not more interesting than the salads. There was a pancetta-wrapped beef filet with caramelized onion grits, a loin of lamb with warm Swiss chard and mint-pesto gnocchi, a seared black cod with carrots and fingerling potatoes, an Alaskan salmon with fennel apple slaw, and a sage-pumpkin ravioli. To continue in my unusually "meaty" mood that day, I decided to try the lamb. And I was not disappointed one bit. The meat was perfectly done, with just enough pink in the middle. The taste was just a little peppery and was juicy and tender. I also really enjoyed the presentation, with a few small slices accompanying the rest of the mini loin. 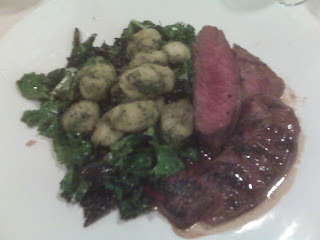 It was flanked by some very flavorful and crispy chard with amazingly light gnocchi and pesto on top. I loved how a dish that could seem so heavy was actually quite light. I was thrilled by this dish and would have likely thought about kissing THIS plate, were I not so distracted by the most innovative dish I have seen in some time. 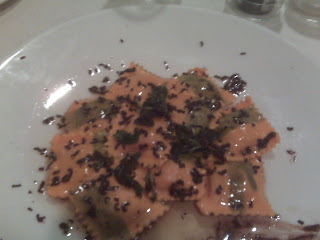 I am speaking, of course, of Julia's unsettlingly good entree of bright orange pumpkin ravioli, with crispy sage, a brown butter sauce, pumpkin seeds and bittersweet, crunchy chocolate shavings. Was it savory or was it sweet? Quite hard to tell, but the taste blew my mind. The smallest amount of chocolate turned a dish I would never bother ordering (gourd-filled pasta) into a dish I'll never forget. Simply put, creative innovation and a penchant for sparkling the palette can turn a typical dish into a mouth-watering treasure. I know, since my mouth quite literally watered. I was completely content after these two courses, and barely noticed the pretty good crème brulee I had for dessert. I was so overwhelmed by the last entrée that I completely forgot to kiss THAT plate either. So instead, on the way out, I kissed the girl who had brought me to this wonderfully elegant and underrated restaurant. Missed the first two installments of the Restaurant Week miniseries? Check out Vinoteca and Kaz Sushi Bistro, and remember to save up a few extra dollars and calories for Restaurant Week 2009! I can't wait to try this place. Hope I don't have to wait until RW 2009, though. Dad. No, I would go back to DB's way before 2009. Their regular menu had a great selection. One that particularly piqued my interest and left my memory (is not on their online menu: http://hiltonarlington.hyperdisk.com/pdf/Dan_Brads_DinnerMenu.pdf) had crispy dumplings in a very innovative pairing. I'll try and remember... And their was a chicken muffaletta sandwich and phyllo-wrapped shrimp that both looked great. Besides their more meaty entrees.